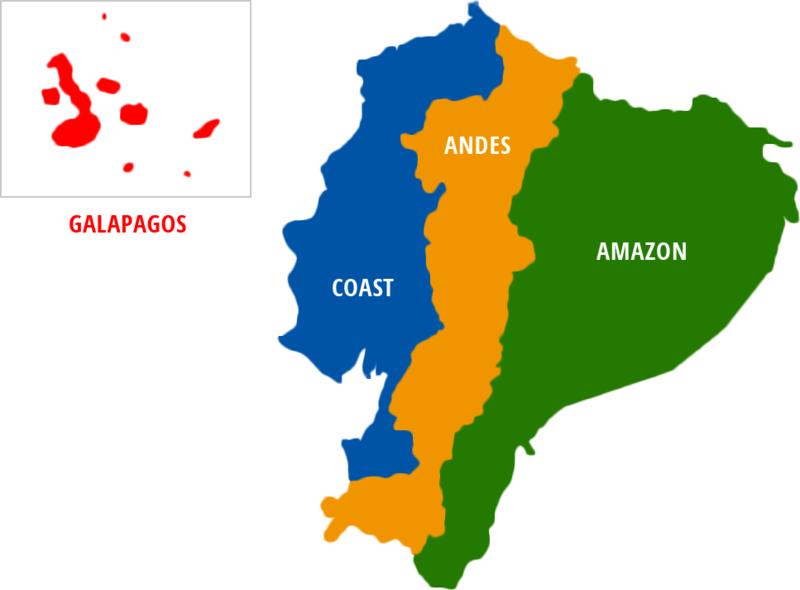 East of the Andes begins the Amazon region, which extends all the way to the Atlantic Ocean in Brazil. Due to its closeness to the Andes it has a very rich species diversity and thus is an ideal region for Rainforest tours. Many rivers that originate in the mountains of the Andes merge to form the majestic Amazon River. In Ecuador, the Napo River and the Pastaza River are the biggest and most important of these tributaries, flowing into the Amazon close to Iquitos, Peru. The Ecuadorian Amazon region has an enormous biodiversity, with the Yasuni National Park being the place on earth with the highest biodiversity per unit. A visit in one of the area’s lodges offers great possibilities to encounter Ecuador’s wildlife, observe birds, monkeys, and other animals and enjoy the lush green of the rainforest. In the north and east you can still find a lot of primary rainforest, while the northwest is more populated. This page gives you a profound Amazon Information. The Ecuadorian rainforest, usually referred to as The Amazon, is the perfect area to explore almost untouched wildlife and to get in touch with one of the highest varieties of animal and plant species. SOLEQ.travel offers several options of Amazon Ecuador Tours which will make for an unforgettable vacation. The Yasuni National Park has the highest rate of biodiversity per unit in the world. If you are interested in rare animals and plants, this should be the reason for you to travel to this outstanding Ecuadorian region. The lodges in the area are very comfortable and offer first-class experiences. To reach them, you first take a plane to Coca. From there a motorized canoe takes you down the Napo River, and finally a small row boat takes you to the lodge. Our 5-days-tour to the Yasuni takes you to one of these Amazon lodges, but of course we can organize different tours for you. Do some unforgettable bird watching, see animals you might not have known that they even existed, and be amazed by the sounds and sights of the jungle. While you will canoe down the amazing rivers or walk along some rainforest trails, your specialist guide will explain to you all the secrets of the Ecuadorian rainforest. One of our other impressive Ecuador Amazon Tours brings you to the Cuyabeno Reserve. This area is famous for its wonderful lagoons and also for its incredible wildlife and kindness of indigenous tribes living in this area. A special sight are the pink river dolphins that you can observe with a bit of luck. Our Cuyabeno Rainforest Adventure Tour takes you to this amazing place. After a short flight from Quito to Lago Agrio you travel by road until you reach El Puente (the bridge over the Cuyabeno River). Here, your adventure begins and you travel by motorized canoe, going slowly in order to not miss the monkeys that hide up in the trees. Be amazed by the Laguna Grande, which you reach after about 2 hours. Your lodge is directly on the Laguna and offers basic but comfortable accommodation. Another one of our Amazon Tours is much closer to Quito. Most lodges in this part of Ecuador can be reached in 3- to 4-hour drives. They are a great option if you have little time and want an introduction to the rainforest. The Upper Napo Tour is one example, of course there are more options. It gives you the possibility to get some insights to the beauty of the Ecuadorian Amazon. You can choose between canoe rides, rainforest hikes, a visit to an animal rescue center, or visits to local Kichwa families. Learn about indigenous culture and share some experiences with the local population. If you are interested in some further information about the Ecuadorian Rainforest, please contact us and ask for your individual tour offer!